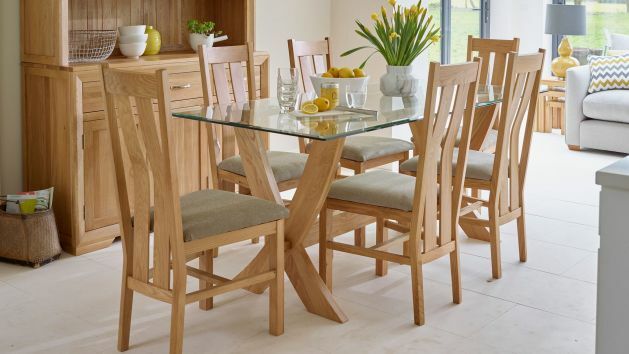 Make a statement in your dining room with our elegant glass-topped dining sets, beautifully showcasing the solid oak, leather and fabric chairs and table. Combining the prestige and structural strength of solid oak legs and the charm and light of glass, our stunning collection of glass dining table and chairs make a strong style statement in any home. Built to the highest standard with 10mm thick glass and the finest cuts of solid oak, each glass set of glass dining table and chairs is designed to be enjoyed in your home for a lifetime. Our matching dining chairs come in a range of eye-catching designs, including our unique tulip chairs, which are guaranteed to draw compliments with their elegantly curved backs and solid oak legs. Elsewhere in our collection of glass dining table and chairs, you can find chic scroll-backed chairs upholstered in fabulous patterned fabric. The dining room is a focal point in many homes, and a space to let your hair down and create memories. Enhance the beauty of your glass dining table and chairs with fresh flowers and a burst of natural light. When it comes time to host a special occasion, delight your guests with a matching oak sideboard or display cabinets, where you can store away bottles and show off your cocktail making skills. The elegance and stylishness of glass dining tables can be affected by marks and scratches. Always use placemats and coasters when drinking or dining and get into the habit of cleaning the surface with warm soapy water, followed by wiping with a damp cloth. Finally, perfect the sheen of the glass by carefully rubbing it down with a dry, lint-free cloth, and your glass dining table set will remain as good as new for many years to come. Protect and nourish your solid oak legs with a beeswax polish, and you can extend the life of your glass top table. Avoid cleaning products that contain bleach or alcohol to prevent the wood from being stained. All Oak Furniture Land orders automatically qualify for free delivery, and your stunning glass top dining set will be delivered to the room of your choice as part of the service. If you’re looking to make your investment a little more affordable, our flexible finance options make paying a breeze. Purchases of £500 or more qualify for a monthly payment scheme for up to four years; spend over £3,500 with Oak Furniture Land and you can enjoy interest-free credit for up to three years.